Throughout WOVEMBER, we’ll be exploring WOOL from several different angles, and today Felix and I are both writing about how wool wears. We knitters are perhaps sometimes more interested in the new and the spectacular than we are in the old and the reliably-wearable, but durability and longevity are important factors to consider when choosing yarn for a project that will actually be worn. Kristen wrote two excellent posts about this very issue here and here, and because Felix and I have both knitted Decos out of two very different breed-specific British pure-wool yarns, we thought we’d jointly write posts about how these garments have worn. 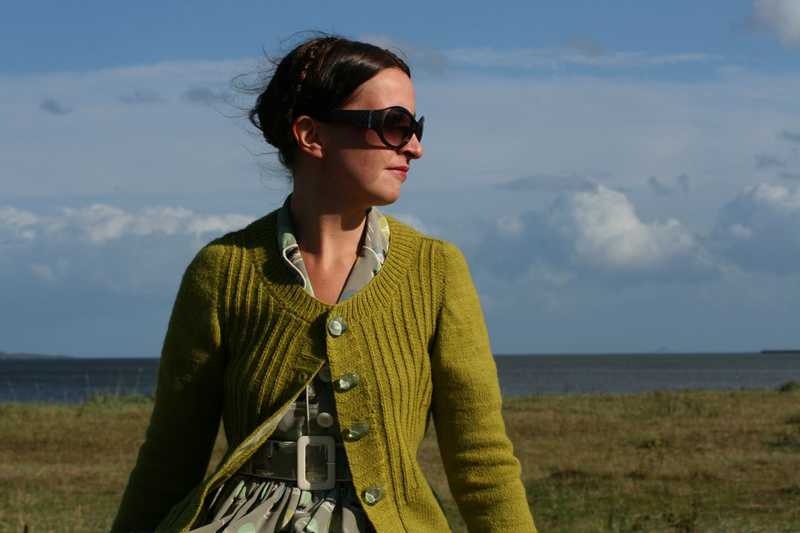 I have knitted many things that have not worn well – and the worst was probably the first sweater I made for myself after my return to knitting – a Kim Hargreaves cardigan out of Big Wool. 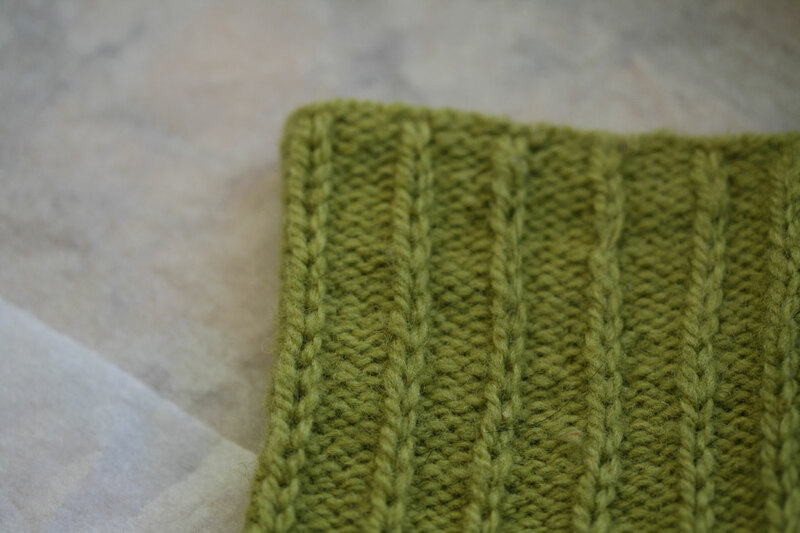 This yarn is a bulky merino, and knits up very fast – I made my sweater in under a week. 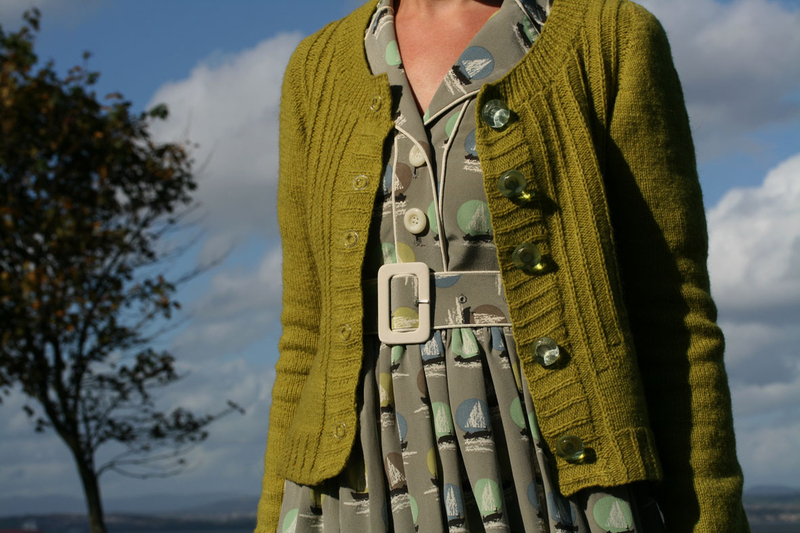 I was very pleased with myself and my cardigan, but within days it had begun to pill, in a few weeks time it had turned into a tatty mess, and after a month or two it was completely unwearable. I never knit with Big Wool again. I would show you this garment, but I was so displeased with it that, after removing its carefully-chosen buttons, I got rid of it. I don’t know if Big Wool has changed, but at that time it was so loosely spun it almost seemed like a single-ply. 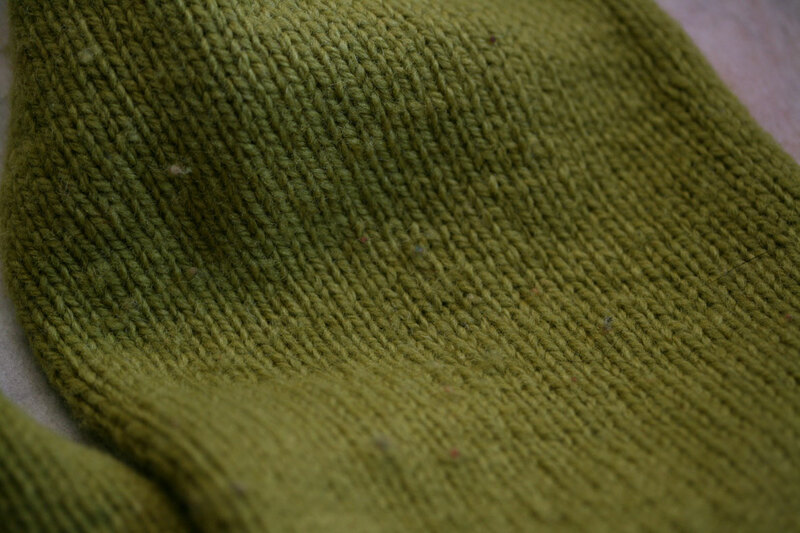 My cardigan was also knit at a fairly loose gauge on, as I recall, 10 and 12mm needles. No wonder that the damn thing pilled! While my big-wool cardigan didn’t see a year, at the other end of the wearability spectrum, I own a hand-knitted garment that is more than 40 years old – a cabled cardigan that my grandma originally knitted for my mum, and was later appropriated by me. I still wear this cardigan, and it still looks fantastic. My grandma knitted it from the sort of old-fashioned, worsted-spun aran that is quite hard to find today. I love this garment for many, many reasons and promise to show it to you another time. 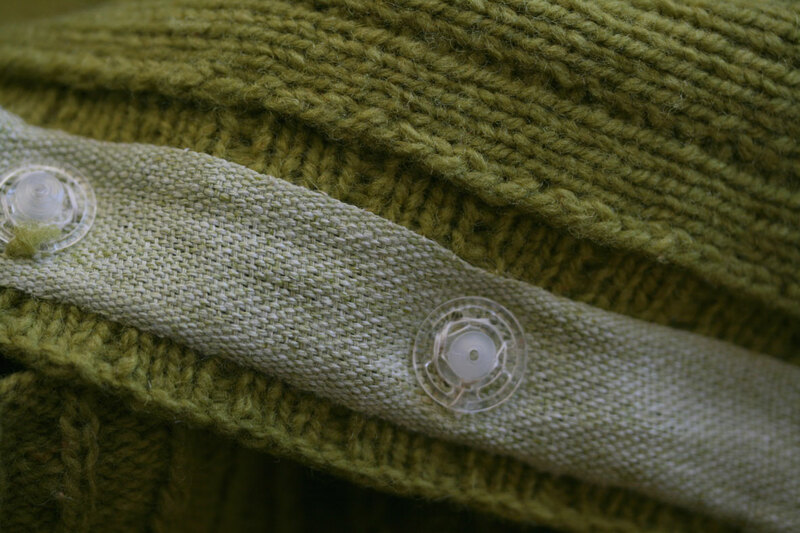 (Deco sleeve cap in 2010). It was the yarn that first excited me when I was designing Deco. 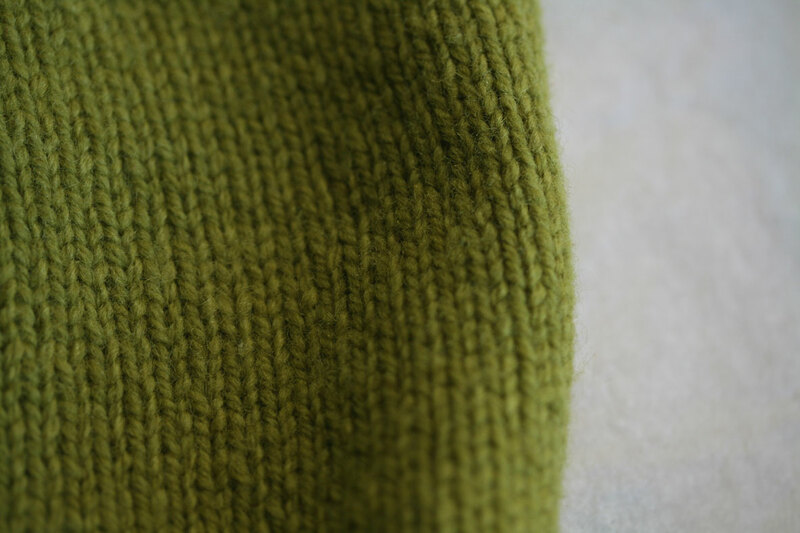 Several of my knitting comrades were fashioning glorious items out of Blacker Corriedale, and when I saw the ‘olive’ colourway I immediately knew it was a yarn I had to knit with. I swatched a simple slip stitch pattern, and it looked so fantastic that the yarn really did tell me what it wanted to be. Before I knew it I had a sketch and design, and was knitting up a cardigan. Quite apart from the fact that I designed it, I just love this cardigan – over the year since it was knitted it is has seen a lot of wear. I like to be outdoors, and Deco has often been outdoors with me. Deco has been with Bruce on many rambles, and it has been frequently jumped on and pawed at by my damp and mucky companion, and his equally mucky dog-pals. But, with a frock underneath it, Deco remains a smart garment too: I took it with me to Dublin in September and, as I had only took one outfit with me due to Ryan Air’s luggage restrictions, I wore it solidly the whole time I was there. (Deco being foolish. September 2011). And here is under the left elbow, a place where you might expect to see significant wear. I know that I have brushed dried mud from this cuff – and do I spot a dog hair? I bound the bases of the wonderful Nichols buttons to reinforce them – they are still luminous, still beautiful, and most importantly, still stable. The tape on the opposite button band is still doing its job very well, and despite being snapped and resnapped many times, my snap fasteners have not come loose. The shoulders and sleeve caps remain neat and hold their shape . . . There are a few little pills there, but if you look closely, you’ll see that, (amidst the dog hair – and do I spy a crumb?) some are clearly rogue pills from a rust-coloured item that Deco has been sitting next to in my wardrobe. Why has this cardigan worn so well? A little of it is attributable to the design (ahem) which, though being seamless, has several features that make for a very stable garment: short row sleeve caps; three-needle-bind-off at the shoulder-tops; close-gauge fabric; and front bands that are reinforced with tape, and use snap fasteners in place of buttonholes. But mostly, this garment has worn well because of the nature of the WOOL I used to make it. I’m in total agreement with everything Deb and Clara say about Corriedale with, perhaps, the minor exception of the lustre since the defining characteristic of the Blacker Corriedale at least is an almost severe matt-ness. There is no sheen to the yarn at all and when dyed, this lends it a pleasing and extremely saturated quality, apparent in Lilith’s gorgeous new hand-dyed Corriedale. There is something velvety about the way the yarn and colour absorb the light. The Blacker Corriedale I used is woollen spun, and when knitting, it feels light and soft and fluffy in the hand. While working it, I expected it to bloom a bit like a woollen-spun Shetland, but it didn’t bloom so much as stabilise. The yarn that felt fluffy in the hand turned into a pleasingly firm medium-soft fabric that also retains the flexibility that befits a knitted garment. You can see that it has good stitch definition, but what you can’t see is that it is really warm, and a little water repellent – great for a cardigan, or other outer-garment. And having experienced this several times, I can also testify that dried mud simply brushes off its surface without affecting the quality of the knitted fabric at all. In sum, I heart Blacker Corriedale and can affirm that you will not only really enjoy knitting with this yarn, but can make a garment which will wear extremely well. I’m certainly looking forward to many more years in my Deco. If these two books are not the cornerstones of your knitterly bookshelf, I suggest you rectify the situation immediately. Great post! I care a great deal about how a piece of knitting wears and got very interested in the yarn you write about, but when I click through to Blacker Yarn’s website, they don’t seem to have this Corriedale yarn anymore. What other yarns would you recommend? I am new to your site so apologise if you have already written about this elsewhere – I came here via a google search and have not yet explored your writings here. Just catching up on old posts – could you, one day, do a post on caring for knitted items? Here in the US most stuff goes in and out of the washer and dryer – do you wash everything by hand? How difficult is this cardigan to knit? 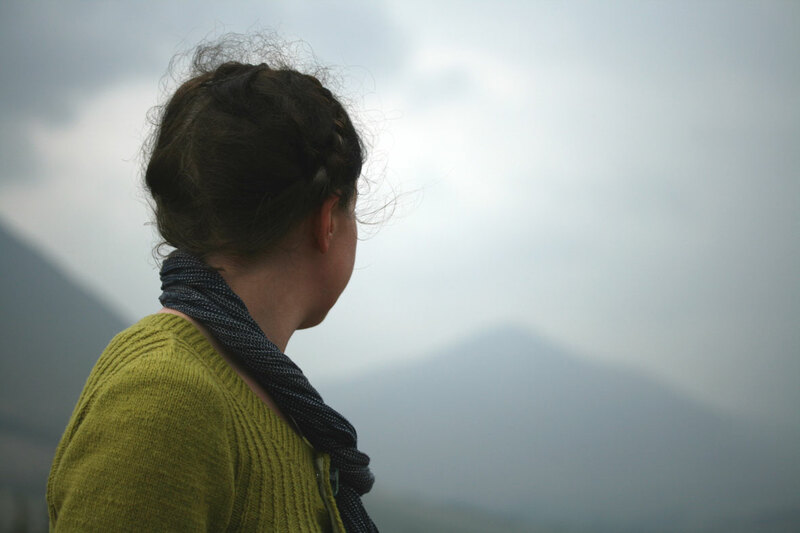 I’m not a knitter – it reduced me to tears and fear and loathing at school – but recently I have felt the strange stirrings of thoughts that I might one day try to learn and knit garments that I would like to wear (instead of bizarre instruments of torture thought up by Scottish schools in the early 70’s). And I would LOVE to wear this cardigan, especially in this colour! Thanks for the tip about The Fleece and Fiber Sourcebook! I’ve bought it after reading your post, and it’s already one of my favorite books. 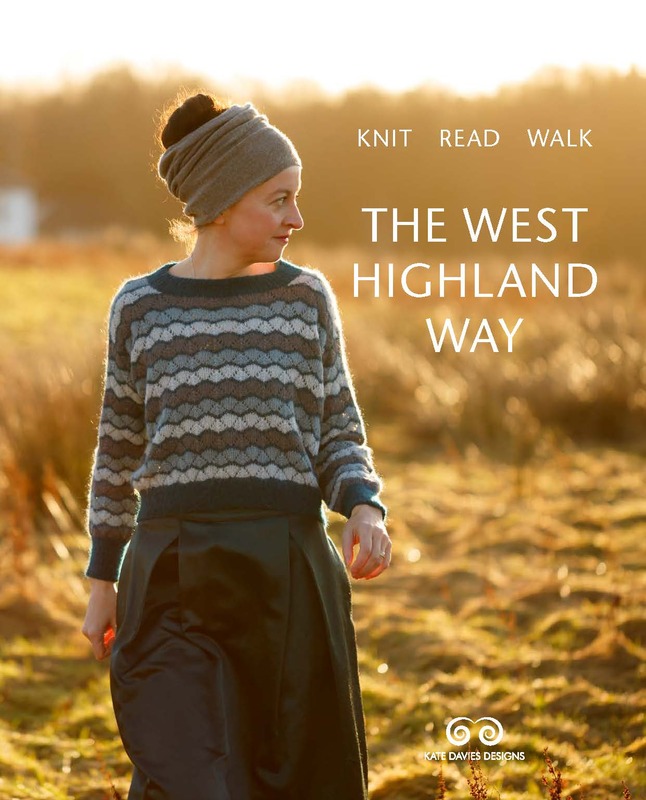 I love The knitter’s book of Wool too, but this one is even better. Perhaps you could blog about why good yarn get discontinued, and what it’d take to revive these. There is a classic here in the US – Germantown Brunswick. a very good, solid, durable 100% wool and had already been on the way to being discontinued when I first got started knitting. If I’d been aware of the fact, I would have made sure to stock up on all that I could find. Nowdays I can only find one skein here and there, certainly not enough for a full-size sweater, and hoard the few skeins that I do have. Fascinating post. I’d assumed that it was all down to the way the yarn was spun, and have scoured secondhand shops and church fetes for vintage crepe wool. (And now have enough for four garments – yay!) I’m pleased to find out there’s more to it than that, and also that there are other knitters keen on hard-wearing knits. I’ve pretty much given up on yarn shops for strong wool, but perhaps it’s coming back. Splendid cardigan. I realised a long time ago, after several sad failures, that it pays to buy the best. I’m returning to knitting after a long pause and your blog is very inspiring. why has no-one mentioned your frock?! Utterly gorgeous. Also inherited? The colour, the style, the fabric pattern, the piping….please excuse my drooling. I will say that years ago I knit a sweater of Lane Borgesia Maratona yarn — a cabled merino wool yarn. It has worn beautifully, though it isn’t a sweater I wear every day. I’ve had it for 20 years and it still looks new. Unfortunately, this yarn is no longer made, and the yarns that SEEM similar are superwash, and ironically are not nice after washing. That said, I’d love to try some corriedale – your sweater is certainly a convincing argument in its favor. what a great post. i’m not knitting just for the sake of it (though that’s definitely part of it), i also want the knitted items to last and for that, the materials used have to be considered carefully. i wish more knitters and designers would post this kind of info – how does the knitted item wear after a year, two years, five years? This is a wonderful post. Through your blog and my own shopping adventures, I’ve taken much more attention to what garments are made of. Not only have I noticed the prevalence of acrylic, but also how high in price those items are marked. I have the challenge, that I believe many share, to having a sensitivity (itchiness) to wearing wool on my skin. As I’ve turned to avoiding man-made textisles, I feel I am often limited by what wool garments I can buy and make for myself. I find I am comfortable in items such as this extra-fine merino sweater: http://www.uniqlo.com/us/CPaGoods/itemcode=068996 . I have a couple articles of clothing from this company and I find they tend to wear and wash well. I don’t have much knowledge about wool and I would love to hear from others about types of wool that I would have less sensitivity to, while also wearing well. I visited the french wool Fonty factory and I wrote an article about it on my blog. I’ve enjoyed your blog very much. I’ve been trying to find the snap fastners on line that you used on your sweater. I’m not familiar with them but think they would be very useful. Do you know if they are available on line or in the US? Totally agree with this post. I’m currently knitting your Deco with Corriedale in the turquoise colourway and think it’s a wonderful yarn to use. As regards old knitting, I too have a vintage woollen waistcoat with broad fairisle border and lovely picot edges which my mother knitted shortly after WWII. When I found it – years ago hidden away as my mother no longer wore it – I just had to have it. And even though it’s a bit big for me, it’s gloriously comfortable, warm and still showing little sign of its age. It’s also beautiful to have this carefully hand-made item as a reminder of her skills with needles now she’s no longer with us. Wool rocks! 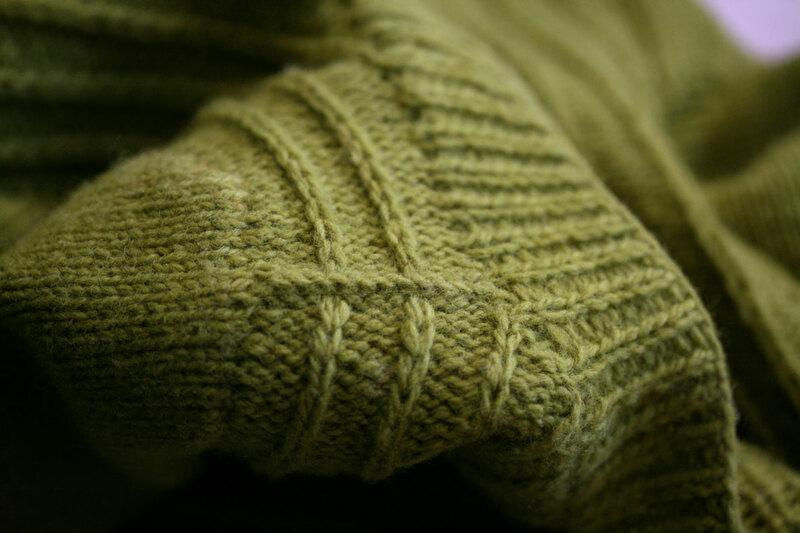 I once knitted a jumper from Perendale yarn, it was 8ply and the front was Fairisle, and around sleeves and bands, it was a beautiful lofty warm, but light wool which wore very well. I read somewhere that the sheep had been raised indoors during the winter, and their fleece had therefor grown differently due to the care, and this had accounted for such a lovely end yarn product. I think a lot has to do with the way the woollen mill processes the fibre to yarn, and the dyeing, because some Merino is much better than others. At present I am learning to spin fibres for my own garments. I found this post very interesting. I bumped into my neighbour’s child recently, wearing a jumper that was obviously hand-knitted and a little bit too big for him. I told him immediately I loved his jumper, and his Grandmother who was standing nearby was really pleased as she said she had knitted it for her son about 30 years ago and a recent attic clear out had rediscovered the jumper and given it a new lease of life. It looked like it had been knitted last week. I really like your idea of a list of well-wearing wools! Is the Owlet I knit for my son out of Cascade 128 going to last through 2 winters and then get passed on to his brother? I’m worried already! Corriedale was the first wool I bought to teach myself how to spin, and it’s excellent! Still one of my favorites. I knitted my Dad a sweater in the wonderful wool from Harris. It’s like cast iron, in a good way. I think I shall inherit it. My handspun Texel / Balwen blend is wearing well, although it is rather itchier than most people would tolerate. I’ve recently bought some Knit by Numbers merino from John Arbon, to make a wrap, but I have a feeling that might wear a little better than the typical fluffy merinos. I have some of Lilith’s corriedale in the stash, thank you for reminding me! Cashsoft dk, feels lovely, pilled the first time I wore the cardie. Now I am looking sadlly at some merino/silk wool I have in the stash – it’s going to pill, isn’t it? (I am a slow learner). 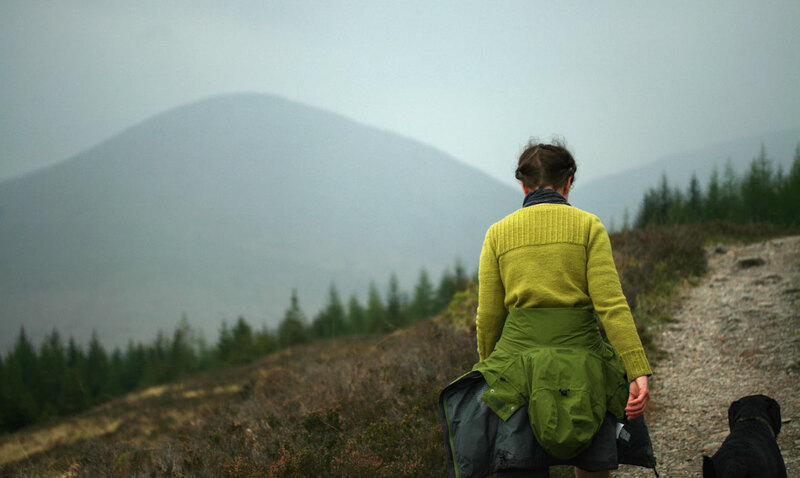 However, I was surprised at a jacket I knitted in Kureyon which has actually worn really well, I think because it felts slightly as you wear it – like my glorious shetland wool jumper which has survived being part-frogged and re-knit, is light and wonderfully warm, and hasn’t pilled a bit! 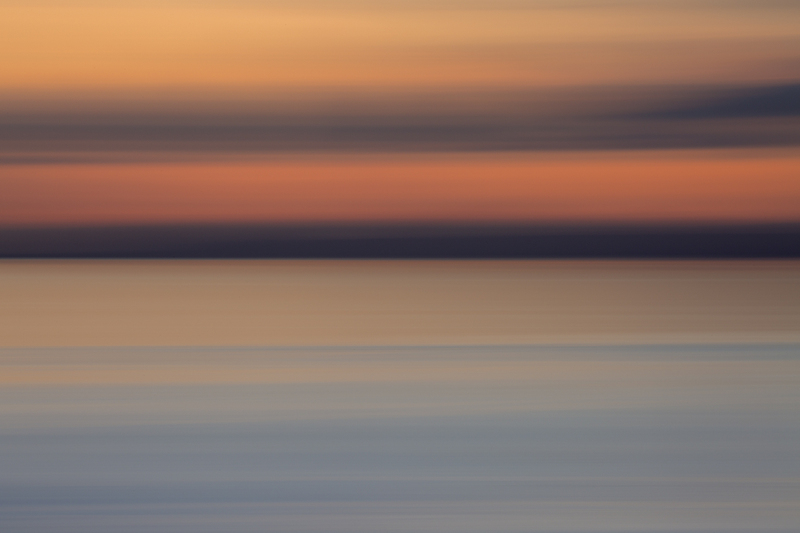 Thanks for a really interesting blog post. I have recently knitted two cardigans, one from Wensleydale Longwool Sheepshop wool and the other from Texere Bluefaced Leicester Wool. I finished the wensleydale cardigan in July and it still looks immaculate, however the bluefaced leicester cardigan was finished in October and I regularly have to attack with a wool shaver! It’s quite disappointing seen as though the bluefaced leicester wool is so soft, but I guess that’s one of the reasons that it pills so much, it’s just not as durable. I have several handknitted jumpers that are 20 or 30 years old or more… knitted by relatives of mine and adopted by me when somebody else wanted to toss them. Most of them are still in pretty good shape. When I returned to knitting a couple of years ago, I made the same mistake as you and was tempted by some glossy yarns and misleading patterns into making garments that did not hold up well at all. But I’ve learned… I focus on traditional rustic wool yarns now and these seem to be working very well. Corriedale is my favourite breed too (but then, I am from NZ!) 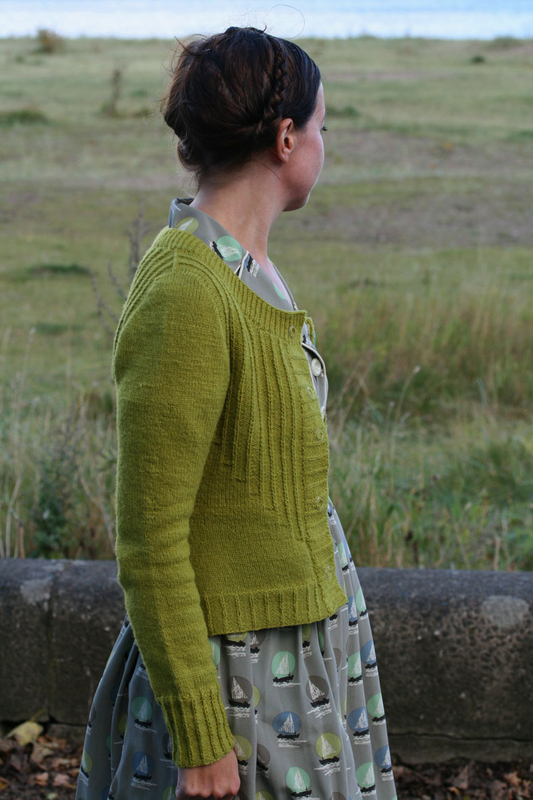 I was reflecting the very same thing yesterday as I wore my own cardigan knitted in Corriedale. It is everything you say it to be. May your Deco see you through many more years of pristine wear! Hi, I have only recently come across your blog and it is beautiful, very inspiring for someone very new to blogging! The cardigan is a great colour and has kept really well over the year. Lovely sweater, lovely post, lovely wool. I’d say about Corriedale that there is a small amount of luster in the wool as shorn. However, it’s not enough shine to remain evident after woolen spinning! In addition, luster in any fiber can be dimmed in processing (by the heat of the scouring bath; the amount and type of scouring aids; any treatments to remove vegetable matter; and so on). 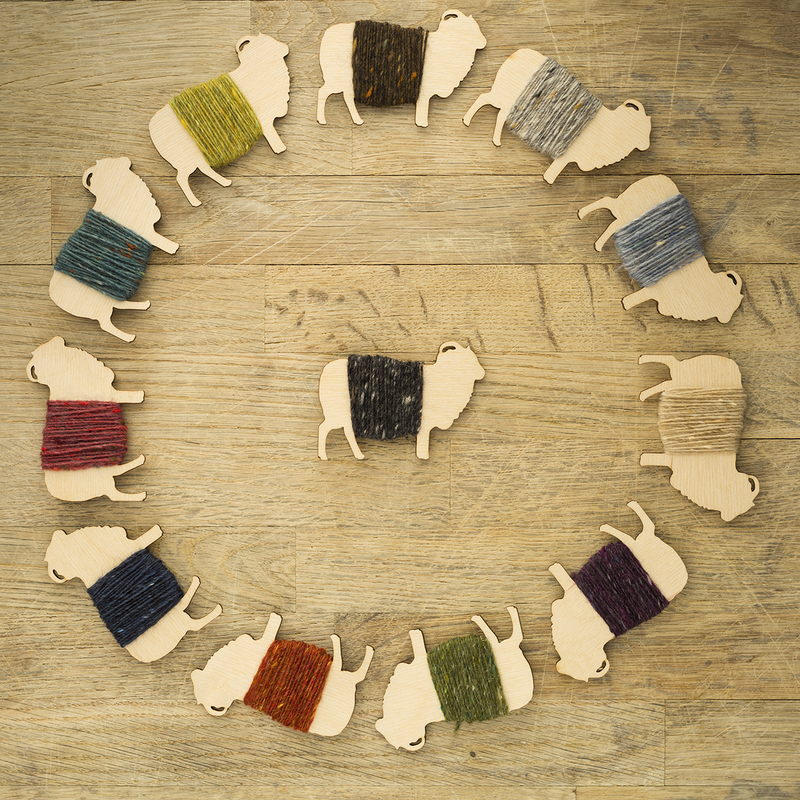 Thanks for the good words about Fleece & Fiber: a labor of love for all the animal fibers, but wool most of all. I love my Deco. I knit it in a completely different yarn (Spud & Chloe’s “Fine” which is 50/50 silk/wool), but it has immediately become one of my favorite sweaters. It’s gorgeous, it fits well, it’s not-too-light/not-too-heavy, and is just generally totally wearable. I adore it already–and I only finished knitting it a month or so ago! I just had a sad experience with a wool/silk (70/30) that stretched out in the garment to a sloppy mess! But your 50/50 is doing fine? Great post! Makes me want to knit wool swatches all day. It’s a quite enjoyable way to spend some time. I bought an Aran cardigan from a charity shop for a fiver. Pure wool if i am not mistaken and I’ve had it for 5 years and it is still pristine – whoever knitted it made a fine job – I think it will live forever. Huge thanks to you and Felix for such informative and interesting posts on the wools themselves, and their characteristics. I’ve been a little wary of adventures in my selection of wool (almost cowardly, I hate to admit), and have found that most of my handknits wear as I expected them to (merino/alpaca in longline jackets is never going to get on very well with my tendency to carry large shoulder bags), but your posts have made me think harder, and I’ll definitely be looking into your recommendations. Oh, lovely! I feel like I have some Corriedale somewhere in my stash that I haven’t tried yet, but I really want to branch out in the coming year and try some new breeds. I do love merino, but the items I’ve made out of longer staple wools have worn SO much better that I think I need to keep trying new-to-me wools. My Jacob/alpaca hat actually seems to get nicer by the wearing, and my BFL sweater is the best wearing of any in my arsenal. I just bought a sweater quantity of a BFL/silk blend and I can’t wait to knit it up. I took a picture of some Rambouillet yarn in my merino post, and I am eager to try that as well – it’s supposed to have a longer staple than merino, and it feels lovely. 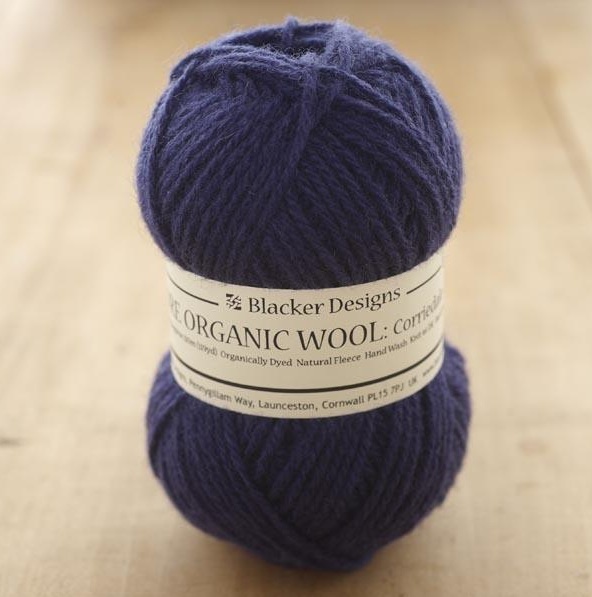 On a separate note, your endorsement of Blacker yarns makes me sad that I live in the U.S. I was on their site the other day looking at Jacob yarns and thinking about maybe ordering some when I found that their standard shipping price to the U.S. is £35. A little too rich for my blood, but oh, the yarns looked lovely! Is it just me or does Bruce have a little look of wooly wistfulness on his face? As though he might enjoy joining in the Wovember festivities. Now he doesn’t look like the kind of guy who would tolerate a “doggie coat” – good heavens – but he might try to persuade his knitter-owner to make him a collar cover in that snazzy Corriedale green. He does, after all, have those impossible to resist eyes. I think it’s cast on 10-15 sts and just knit a row, purl a row until long enough to go around Bruce’s neck. Seems to me it then curls around the collar and sticks like ear muffs. Details on finishing are also a bit sketchy but I think it just clings – no fastening required. I’d love to make “Deco” and I’ve read such positive things about Kate’s patterns and ease-of-use. Makes me feel like I might stand a chance of making one. I’ve really enjoyed reading your love letter to Corriedale! I had the same experience with Big Wool, so never again for me either. On the other hand, I have rtw garments in fine-gauge machine-knit merino which have performed beautifully (still going after two decades) and have been well pleased with the two-ply superwash merino sock yarns offered by so many hand-dyers. Surely some spinning mills are preparing merino better than others. I’m keeping an eye out for Corriedale for future projects, though. Parkes’ Book of Wool was a birthday present to myself, and the Robson Sourcebook is high on my wish list. 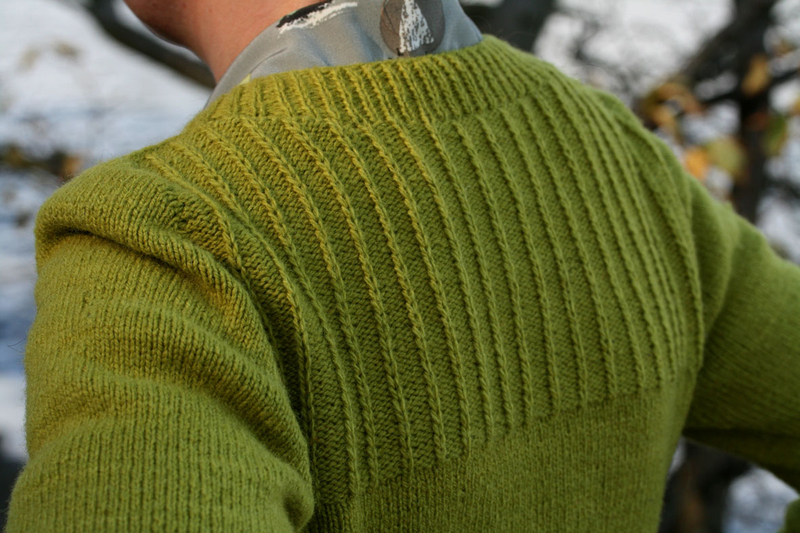 Your Deco is such a handsome sweater – so glad the yarn is proving such a champ! Not only are some mills spinning Merino better than others, there are a variety of types of Merino. EACH can be spun into a serviceable yarn (though the breed will never have the durability of inherently stronger fibers). But you have to be paying attention to durability. Squishiness in the ball has become the great selling point right now. Sigh. Great post Kate. I am fed up putting good work into projects that pill and wear very quickly. Your Deco still looks new, although “old” in style. I will definitely try some Blacker Corriedale and Deco in the new year, when my Christmas knitting and my Warriston are finished. I’m delighted you have brought this topic to the fore. Too many yarn manufacturers just don’t care how the yarn wears, as long as it sells. Keep up the wool fight. Great post! I couldn’t agree more. I treasure my knitting very much and I expect to enjoy each piece I knit a long time. I own a cardigan knitted by my grandma for my mother and it’s great too. Wooowww! Like, no pilling. Definitely putting that yarn on my list! Beautiful, as always. Fascinating and erudite as ever! So I need to buy some corriedale, eh? And that Deco pattern too by the looks of it. Just let me finish my Christmas knitting and I’ll be there! I actually just finished blocking my Deco sweater and I can’t wait to wear it. I hunted down 100% Corriedale yarn for it and I can already tell, without wearing the sweater, that it’s going to wear well. And, all credit to the design, it’s a beautiful sweater and one of the best I’ve knit so far. I think it’s my fourth cardigan ever. A question: I still have to do the finishing and I can say with certainty that the snaps I bought look nothing like the ones on your sweater. Any hints on where someone in the US could order those online? (I have a friend in the UK and she’ll send them to me if necessary!) I’ve never seen anything like them in this country–and I’ve looked. They look much better than what I found online. I made a pullover some 30 years ago in Briggs and Little wool that has been through every cold season since, and it is in almost perfect shape. 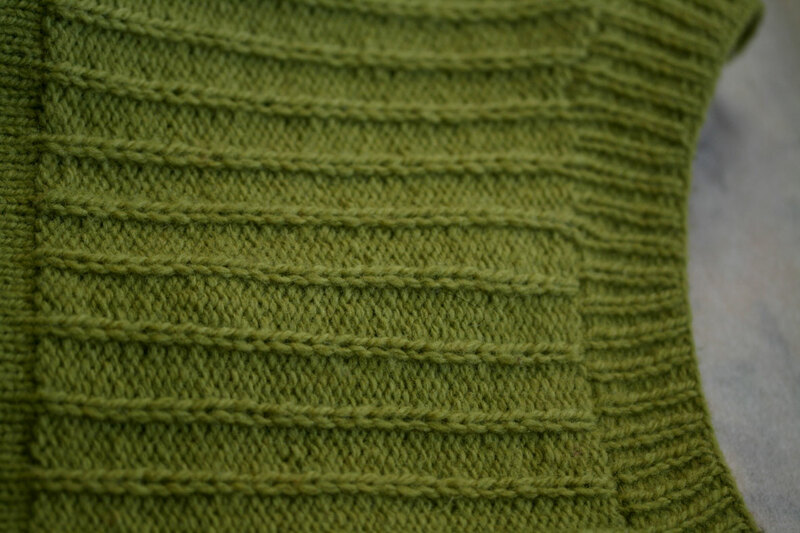 I also made a pullover for my honey, again B & L, and his is pilling like crazy. His gets used a lot in the workshop and when he flies outdoors; it is a working garment and shows it. I think it depends on the wearer and how it is used. How a garment wears is a key fact and I found your review very enjoyable. I have this pattern but had been toying with using a different (albeit British) wool. I’ve recently knit some with BFL and that’s a rugged wool with nice loft. 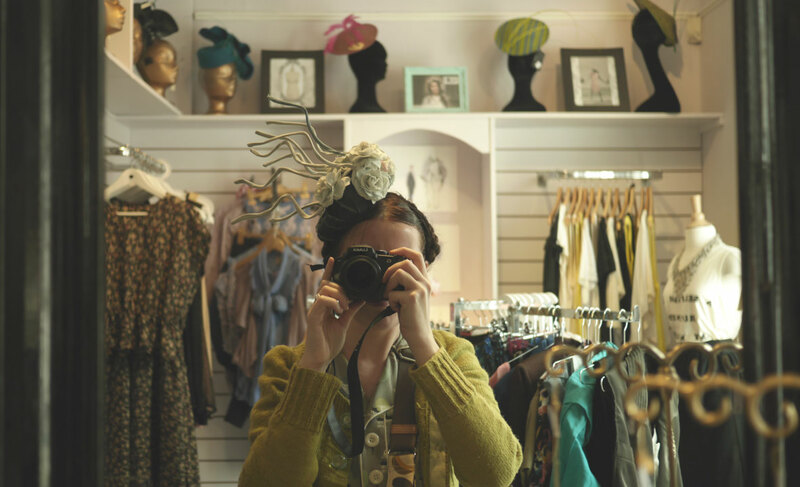 I so enjoyed the photos in this post, recounting the story of your Deco and its travels in the year since you knit it. I love the velvety, “severe matt-quality” of Blacker designs Corriedale in my Lyttleton, too, and I’ve some 100% wool socks knit in this same yarn which have fared extremely well considering they have no nylon in them, and that I like to do LONG walks when I go out in my hiking boots. Your description of the qualities of the wool is extremely interesting, and I had not realised Corriedale was a Merino-cross. I find 100% Merino yarns to be overly soft and not at all practical for regular wear. The pilling mess which results is very displeasing. However I LOVE knitting with Corriedale and perhaps in cross-breeding Merinos with sheep who produce a hardier fleece, that impractical softness gets an extended life and some extra strength and hardiness? 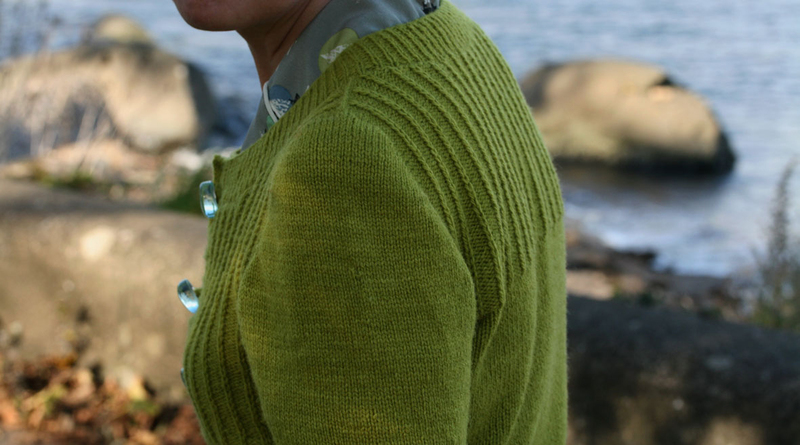 Thank you for sharing the story of your wonderful cardigan with us. It looks FANTASTIC and I think your idea to design with a grosgrain reinforced button band is a genius way of extending the life of a 100% WOOL garment. Even with the finest wool in the world, opening and closing buttons does eventually take it’s toll on even a very densely knitting fabric. I love the way my grosgrain ribbon and poppers preserve the straight lines of my Deco. Huzzah for 100% WOOL Decos! Fascinating and useful post. Thank you! I am heartily in agreement with you about Corridale wool! I felt my first skein of it not so long ago and snatched it right up. I am so sick of the overly processed merinos that are on the market (I may be the only person in the world that does not like Debbie Bliss’ yarns. Nothing against the lady though!). It is lovely to see how well your sweater has held up. Considering the time it takes to make one, I wouldn’t want to find it unwearable in less than a year’s time! I will be keeping your point in mind the next time I buy wool for a sweater. I love that sweater too and would wear it everywhere if I had knitted one. It looks so old fashioned like a sweater the pioneers might wear as crossing the plains and yet since designed after skyscrapers it is SO modern too. Love it. The fact that the buttons are more decorative and don’t actually button is inspired. Hear hear! I’m also not convinced by merino. Yes, it is soft, and this usually gets accentuated by being spun into a very lofty woollen spun yarn. This feels great in the ball, but it doesn’t wear. When you wash it, it grows. It wears out quickly. It pills. Heels and toes turn into a felted mess. I too prefer other yarns. And a firm gauge! As an aside, after one malabrigo sock too many (and I only ever knitted two pairs with it), my current 100% animal fibre sock yarn favourite is Blacker’s 2-ply sock yarn, which is 50% british wool (unspecified breed) and 50% mohair. It’s very durable. Simply as a note, I would describe the Briggs & Little Regal yarn I have used in the past as worsted-spun aran. If you ever want someonething that is similar. I’m not an expert at spinning techniques so maybe I’m completly wrong, or maybe I informed you on my favourite woolen! My husband has an Aran sweater knitted my his mum, probably 45 years ago. It is not matted and still keeps him very warm. A very interesting post (as usual) thanks Kate.